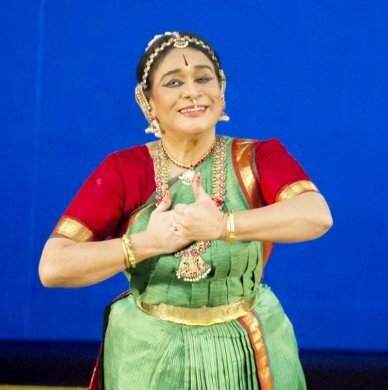 Bragha Bessell's performance under the aegis of Nadam, at the ADA Rangamandira in Bangalore on 24th April, marked the celebration of fifty glorious years of her dance journey. A consummate artist, teacher, choreographer and connoisseur of the art of abhinaya, she began her performance with a varnam "Ati mogam konden maane." The varnam in Shankarabharanam raga and adi talam speaks of a nayika in distress over her absent lover and her longing for him to return. The heart of the varnam, with its lyrics in praise of the celebrated nobleman of Thanjavur, Lord Ramalingendra, captured the mood and intricacies of sringara and the subtle abhinaya to convey the message. The narrative provided for many intense and aesthetic interpretations by the artist, be it the love letter written by the nayika and packed in a lotus flower and sent to Ramalingendra, the anguish and torment of the Pancha Banams of Madana, or the anxious wait for an endearing glance of her lord as he goes on a procession. The visualisation of the events were marked by an intensity that poured sweat out of her sinews. The short and crisp jathis provided powerful rhythmic interludes and the lengthy varnam showed the stamina of the artist and her ability to go through the narrative with a finesse that set it apart as one of high classicism and elegance. The aural landscape with Hariprasad (vocals), Muthukumar (flute), Vedakrishnaram (mridangam), Ananth Narayan (veena) and K.P.Rakesh (nattuvangam) climbed to a heavenly scale of harmony as it coaxed the dancer to a variegated display of emotions that were neither intrusive nor stressed and yet powerful and poignant, charming the audience with the characteristic signature of a sublime flourish of her exit from the stage. The padam "Indendu Vachitivara" explored the sentiments of a nayika berating her lord for knocking on the wrong door. ‘Even in this bright moonlight, you have come to the wrong house and I am not the woman that enchanted you with a tight hug! Go away!' The performance had a sense of clarity, maintaining the sthayi bhava, never overpowering and lucid in its execution providing the indelible stamp of an artist beyond compare. She followed it up with a soliloquy "Yashodara Vilapam." This piece, a tribute to the famous Telugu writer Basavaraja Appa Rao who passed away on 22nd April, was sung on record by T.Suryakumari more than fifty years ago.Yashodhara laments over the departure of Siddhartha who leaves in the middle of the night to seek enlightenment. "He did not even wake me up to say goodbye and did not even show his face. What could be the reason for his anger? What have I done? As I slept securely with my head on his chest, how could he desert me? Why are the clouds and sun so happy? Am I to wail on the floor like a creeper whose support has disappeared? Will there ever be light in this house at dusk? Can the door tell me which way my husband left? Oh, my eyes couldn't warn me with a dream?" Bragha's portrayal of the depth of lament, misery and pathos with expressive facial expressions imbued with innumerable moods exploring the situations inherent in the lyrics showed her histrionic ability to use not only her eyes but the entire body to express the bhava and the feelings. The devarnama "Jagadhodharana" that followed shows Yashoda rocking the cradle of the creator of the universe. Yashodha plays with him whom she considers a gem amongst children. He is within the atom and he pervades the universe, the greatest of beings and son of Vasudeva, the one who resides in every living creature; the Vittala of Pandharipura is lulled to sleep by Yashoda. The artist marked by her individual creativity used subtle overtones of abhinaya in her delineation, the tenor of her expression captivating as she presented several facets of Krishna as no ordinary mortal, the illusion that the ksheerasagaranayana needs to be given milk and the seshasayana can be endangered by a small little snake or that the child Krishna to be put to sleep featured evocative visualisation inspired by moments of tenderness and motherly affection. In the ghazal "Aaj jaane ki zidd naa karo" (Do not be stubborn. Please sit with me. If you go I will be lost and will die. Please do not go. All our lives are dictated by time! This is the moment we are free! Do you want to lose this precious moment and search for it all through your life? Please do not be stubborn.Come sit by me.) Bragha showed her mastery over the format of Bharatanatyam, taking it to a higher plane and the power of subtlety used by her demonstrated that any song or poem can be interpreted through portraying emotions using the entire body to convey the feeling of the narrative. She concluded with a javali "Apadooruku lonaithine" in Khamas, a composition of T. Pattabhiramayya. "I have become notorious for no reason. I wonder which evil woman started this rumour. As a lark to see the festivities, I went up to his house along with my friends. For that, I have become notorious. Every time I came across him I smiled at him. For this, they called me a loose woman. Just because I have known him well from my childhood, they are saying that I am carrying on with him," laments the nayika. Bringing out the nayika lakshana in no uncertain terms, Bragha's nuanced skills of abhinaya emphasised various sentiments expressed in the lyrics. The whole performance of Bragha Bessell, beginning with a varnam in Tamil, javali in Telugu, devarnama in Kannada, ghazal in Hindi and concluding with a javali in Telugu, metamorphosed into an endearing experience that will be cherished for a long time to come. As the audience stood up in appreciation, the prima donna of abhinaya, Bragha stood tall in all her humility and grace as the fifty glorious years resonated with a sense of fulfilment and belonging. Bangalore based Satish Suri is an avid dance rasika besides being a life member of the Music and Arts Society.